P&G and Amazon face investors on the same day. Can Cincinnati handle the results? CINCINNATI -- It could be a bellwether day for the Cincinnati economy Thursday, as Amazon Inc. and Procter & Gamble Co. both report quarterly results. P&G is the 13th largest stock on the S&P 500, as ranked by its $228 billion market value of all shares. Amazon ranks third on that list, at $502 billion. Amazon is investing heavily in the Tri-State as it gears up to compete against Cincinnati’s largest retailers, Kroger Co. and Macy’s Inc.
It’s only the third time since 2012 that P&G and Amazon scheduled earnings calls on the same day. You can bet Cincinnati investors will be looking for warning signs in the numbers. For P&G, it’s a chance for CEO David Taylor to prove that the company’s “shrink to grow” strategy is finally working -- and there is no need for activist investor Nelson Peltz to join P&G’s board. For Amazon, it’s a chance to bellow like the 800-pound gorilla that scared investors away from many retail stocks this year. Shares in the Kroger Co. lost 19 percent of their value on June 15, when Amazon announced it would buy grocery rival Whole Foods Market Inc. Macy’s Inc. shares are down 33 percent this year, prompting some analysts to speculate that Amazon could buy the department store chain. That kind of blockbuster news is not likely when Amazon briefs investors on its second quarter results after the market closes Thursday. But there could be news that has a Cincinnati impact. For P&G, one of the key numbers is organic sales growth, which tracks revenue excluding acquisitions, divestitures and other one-time aberrations. The company told investors in April to expect full-year growth of 2 to 3 percent, but analysts have been predicting worse results in recent weeks. Edelstein said P&G could gain some credibility in its proxy fight against Peltz’s Trian Partners if it surprised analysts with organic sales growth above 1.5 percent. “Anything less than 1 percent really helps the Trian story,” he added. But that’s only the start of the numbers game that investors will be playing Thursday, as they look for signs of wreckage or renaissance in the growth strategies of Cincinnati’s biggest companies. WCPO will be watching all numbers highlighted in bold, so look for additional coverage on Thursday and Friday. Analysts polled by Thomson Reuters are expecting Q4 net sales of $16.02 billion at P&G, down about $800 million from the same period last year. Those analysts also expect core earnings per share of 78 cents, down a penny from last year. If P&G falls short of either number, its stock price could drop. 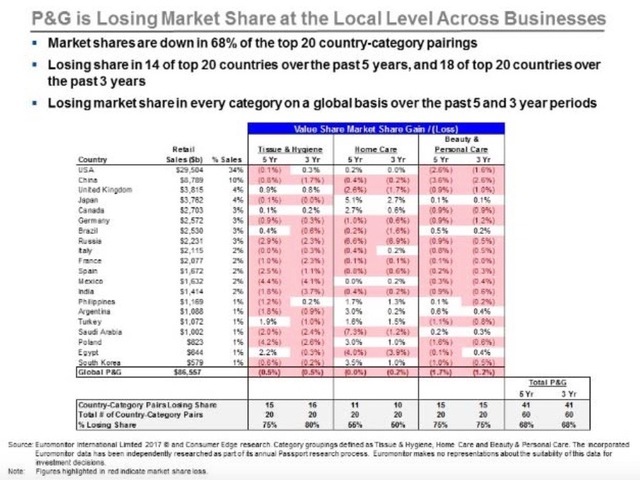 Beyond those basics, Trian Partners has singled out market share loss as a cause for concern, telling investors in a July 17 securities filing that P&G lost share in 14 of the top 20 countries where it competed in the last five years. The New York-based hedge fund used data from Euromonitor International and Consumer Edge research to illustrate the countries and product categories where P&G lost share in the last three and five years. P&G rarely discloses market-share data in this kind of detail, but now that Peltz has put the issue in play, Taylor and Chief Financial Officer Jon Moeller are likely to face questions about it. P&G is likely to highlight any evidence that its cost-cutting and brand-selling strategy has led to increased investment and market share gains in the 10 categories where it now competes. When Amazon takes center stage at about 5:30 p.m. tomorrow, almost no one expects a lot of detail on the company’s plans for Whole Foods because that deal is far from being final and could be derailed by the antitrust scrutiny of federal regulators. Investors are expecting a 23 percent increase in Amazon’s revenue to $37.2 billion and earnings per share of $1.40. Because it’s impacting so many different industries, Amazon could spark a volatile Friday if it falls short -- or dramatically exceeds -- those estimates. Those who are watching Amazon because they’re worried about Kroger and Macy’s should keep an ear pealed for North American sales growth and profit margins, Edelstein said. Similarly, North American sales growth of more than 20 percent would be a signal that Amazon is continuing to gain market share against traditional retailers.